It was around about this time last year that I took myself on a pilgrimage to Blyth Spartans for their 3-0 friendly win over Carlisle. One year subsequent and I'm back in the North-East once more, arranging a stag weekend for my man Mr Tricker two weeks in advance of his famous nups. The reason for making Newcastle the location? Well, despite meeting when we were 2 in Havant, he spent about 4 years in his mid-teens living in Morpeth, Northumberland, and this shindig provided ample excuse to visit the city just down the road. Making the most of my sole area of expertise, I was requested by the head of the herd to organise a trip to a non-league pre-season friendly as part of the weekend. Sadly, Morpeth Town weren't in action and so Dunston Fed v Workington was looking the best bet until it became clear that the Toon themselves would be playing at home in the Tonto mug. With native Geordies in our party, including one half-responsible for Toon blog 'Black & White & Read All Over', this was clearly the only way forward, particularly at the nice price of £12 a seat. You'll note below the bridegroom-to-be and Ben looking fairly happy with their saving. With all the other focuses of the day, you'll have to excuse the laissez-faire nature of this write-up but, as it goes, this hobo has left a light foot-print here before, popping in as a guest of Leon's dad (who was working for one of Newcastle's major sponsors at the time) to have a look at the ground. No game, and only about 5 minutes, but a path trodden nonetheless. That was 1994 though and SJP looks a lot different now. There's not many football grounds, particularly major ones, that lie slap bang in the centre of town, but the new SJP's gigantic new stands tower over the city like the 21st century fortress it is. However, as the visit of Slovak side ZTS Dubnica failed to capture the imagination of about half the usual crowd, it was far from fortress-like inside its walls. However, a brief conga was made possible at the peaks of the two top-heavy sides thanks to the wide spread of bodies in the gods. You can hardly blame the lack of numbers, indeed 25,000 was pretty high considering the game was virtually a dead-rubber thanks to the Toon's 3-1 first-leg lead. Besides, the phone-lines were never going to be jammed for a side who finished 4th placed in a country many probably still believe to be merged with the neighbouring Czechs. Furthermore, Dubnica also appear to be a club with an identity crisis, having got through several variations on their monicker since 1948, with Sokol Vorošilov, DŠO Spartak and Kerametal amongst the 8. Probably safe to say that the fall and rise of Communism played its part in their multiple personality. As expected, Dubnica didn't particularly offer much in terms of an attacking threat but were fairly tidy at the back when necessary. 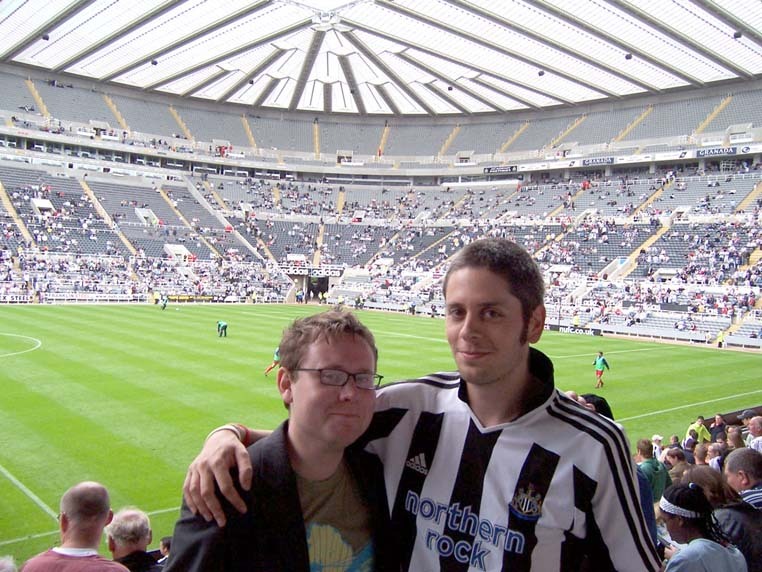 That said, Newcastle approached the game much like one might a poolside sunlounger. Physical exertion was certainly not the order of the day, and you can't really blame the Newcastle team for saving their legs with the prospect of the first leg of the following round occuring merely 4 days on. 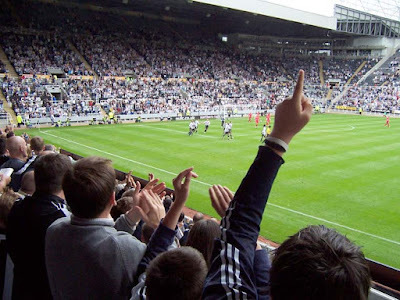 However they certainly didn't have the look of a side that will set light to the Premiership this year and displays like this will not end the disquiet among Newcastle fans toward Graeme Souness' managerial abilities. 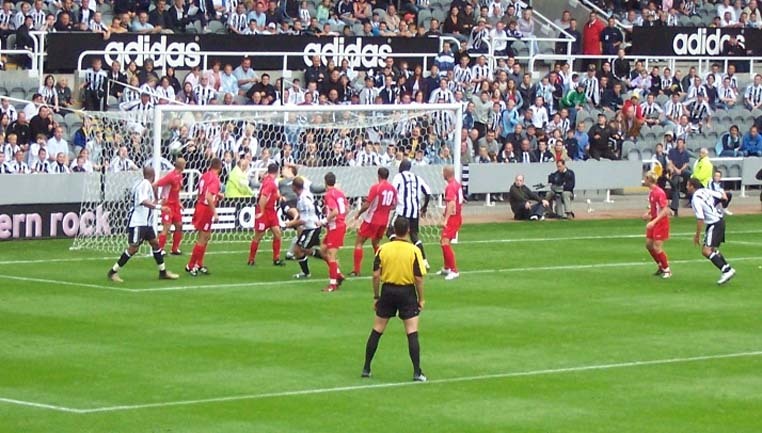 There were certainly things to enjoy in the game though, not least the fact that the Alan-Shearer-Annual-Farewell-Tour™ was able to wheel away arm-oustretched twice more in pursuit of Jackie Milburn's Newcastle goal-scoring record. 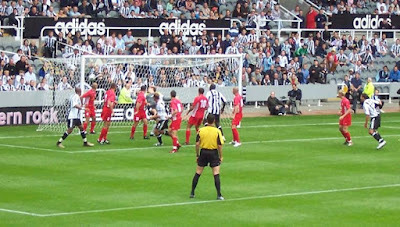 The first goal can be seen in the picture immediately above, while the celebrations for the second feature in the middle shot. That Michael Chopra apparently can't remember anything of the ten minutes he played between being sparked out by the keeper, and his substitution, is also faintly amusing considering he still looked more alert and interested in those moments than Celestine Babayaro did at any time during the game. That though, is more a point for a Newcastle fan to make and so, to make up for the lack of insight here, Ben's Black n' White musings can be found here, with just the right mix of partiality and exasperation.